It has been a tough winter but we are almost through it. There is a good feeling out there and many believe we are in for a good summer especially with the opening of Tūranga the new central library later this year. The $92 million public library – set to become the most modern in the southern hemisphere – will feature an array of high-tech learning experiences, as well as a new café and espresso bar split between its ground and first floors. We expect the opening to attract huge crowds coming in to the city to see this wonderful new community asset. The Business association is currently completing its annual report and financial statements. We are looking forward to presenting these to you at our AGM mid October. It has been a big year for the association and we are looking forward to sharing with you our progress thus far. At our recent business forum we had Superintendent Lane Todd talking about policing in the central city, their strategy going forward and the new resources to be implemented. There was excellent engagement from the attendees who were keen to here how the police intended on dealing with the begging and homeless issues on the streets of our city. One thing is for certain, it is an issue the city cannot arrest its way out of so we have to work together to find the solutions. We had two central city businesses talk about their experiences opening a business in the city. Nick Inkster from OGB and Annabel Turley from Cashel Pharmacy talked though what they had to do to ensure their survival in the emerging city retail environment. It was really interesting to hear about the ongoing challenges and the solutions they come up with. Insurance Brokers AON provided the attendees with some interesting facts around how best manage and mitigate business risk. They highlighted the emergence of cyber attacks and said that many businesses had not given this high risk area enough attention when insuring their business. 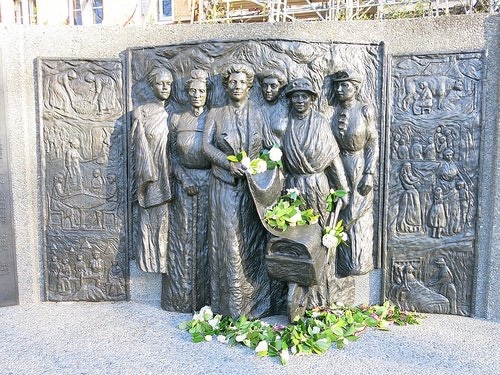 The Christchurch City Council are currently reviewing the Public Places Bylaw and Policy. The Business association will be making a submission through the review process as we have concerns that the begging and homelessness issues have not been identified as an issue. The proposed extension involves expanding the 30km/h zone one block south to include St Asaph Street, and westwards to include short sections of Hagley Avenue and Riccarton Avenue. These changes are intended to make a safer street environment for everyone – helping improve the safety of the main Hospital access points, and support the Christchurch Outpatients Facility, new South Frame developments, including the new Ao Tawhiti Unlimited Discovery School opening next year and the planned Metro Sports Facility. 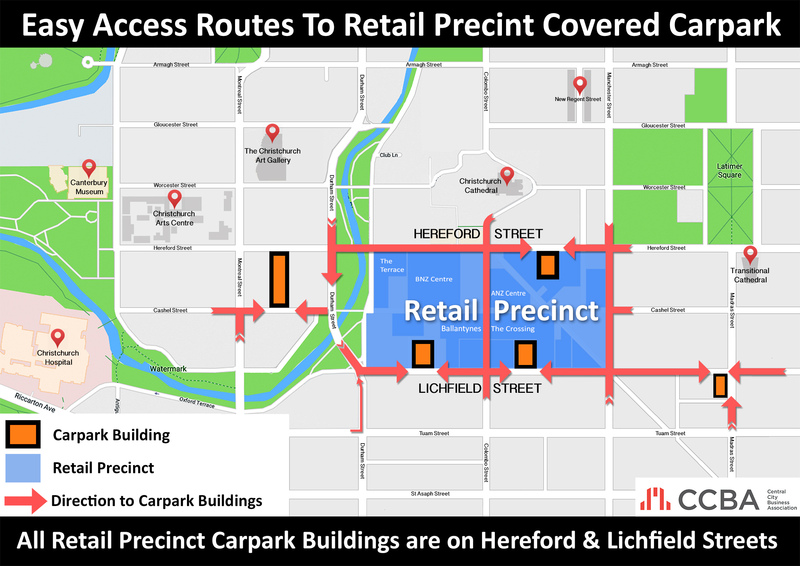 Below we have updated our easy to understand map of the major off street car parking buildings in the Retail Precinct and how your customers can access them. Please notethe two way change to Durham Street from Tuam to Lichfield to enable easy access to the Lichfield Street car park. Please feel free to download this map and share it on your social media networks.